As the average lifespan of our dogs increases so does the chance that owners will see age-related issues arise in their senior pets. It’s pretty easy to spot senior dogs in a crowd by their distinguished graying muzzles, the slow, deliberate movements, and the distinct look in their eyes that says “That’s right, I’ve seen it all:’ Advances in nutrition, pet health care and more have greatly improved upon the average lifespan for our canine friends. Unfortunately, as the average lifespan of our dogs increases so does the chance that owners will see age-related issues arise in their senior pets. As a dog begins to age his veterinarian will likely start to recommend doing some tests to make sure the dog’s internal organs are functioning as they should. It’s recommended that owners have yearly blood work done on their pets if the animal is healthy, and increase that frequency if any clinical signs present themselves or if abnormalities are seen in the blood work. 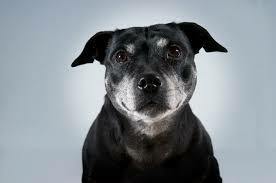 Geriatric dog owners should also increase their awareness of how their dog is acting and feeling. It is important to be able to recognize what is normal for the dog that when there is a change owners – and pet sitters can recognize it. Two of the most important tools that a veterinarian uses to start narrowing down the list of possible problems are an accurate history from the owner and a thorough physical exam. Bringing a pet in to the veterinarian is only the first step; it is important that pet owners share with their veterinarians any changes and symptoms their pets are displaying. There are certain conditions that are more common in our elderly dogs including arthritis, renal (kidney) disease, canine cognitive dysfunction, neoplasia, cardiac diseases and changes in vision and hearing. With these conditions come certain signs and symptoms that, when seen by the owner, pet sitter or veterinarian, can lead to a quick diagnosis of the problem. Arthritis is one of the most common problems encountered by aging pooches. Just like with humans, some dogs have a higher tolerance for pain than others. That rneans they will be slow to show any symptoms of this degenerative disorder. Some owners may notice that their dogs are slow to rise after resting or lying down for an extended period but are otherwise acting normally. Other arthritis symptoms to watch out for include: a decrease in activity level, unwillingness to walk, run or play, decrease in appetite and changes in temperament. If a dog has been diagnosed with arthritis, the veterinarian can recommend some safe, prescription anti-inflammatory medications that can help to reduce the peťs pain level and increase its quality of life. It’s best to stay away from using any human medication on any pet, unless recommended by a veterinarian, as many of these medications can be toxic to pets. Another common senior health problem in dogs is renal disease, where the ability of the kidney to function as a filtering and elimination organ for the body slowly begins to fail. Subtle changes in a dog’s kidney function can be picked up on the recommended yearly blood work before any outward symptoms have presented thernselves. Since kidney problems often cause symptoms like increased water consumption and increased urination, if blood work is not done or if the problem develops rapidly before it can be caught on a routine blood panel, owners may notice they need to fill the water bowl more frequently or that Fido asks to be taken out on walks more than usual. Owners should understand that while kidney disease is usually a degenerative dlsease it is not necessarily a death sentence for the pet. There are drugs and treatments on the market that can greatly increase the dog’s quality of life and delay the progression of the disease. The one disease that every owner dreads hearing about is neoplasia (the formation of tumors). Unfortunately, it is a common problem in geriatric dogs and is also one that can be incredibly difficult for your veterinarian to diagnose. It is the ability of cancer to mimic other diseases and include multiple organ systems that makes it so difficult to pinpoint on a diagnostic work-up. In order to diagnose neoplasia, a veterinarian may ask for extensive diagnostic testing, which is necessary in order to rule out and narrow down the list of possible differentials a peťs symptoms and signs may point to. While the necessary diagnostic tests can be expensive, if a pet owner is interested in pursuing further treatment for the pet, these tests are essential. The animal’s prognosis and treatment strategy will vary greatly based on the results of these tests and whether a final diagnosis can be made. The disorder known as canine cognitive dysfunction (CCD) has increased in recognition as a problem for our senior dogs in recent years. CCD can be compared to Alzheimer’s disease in humans where the ability due to the similar syrnptorns that are displayed and the changes that the brain undergoes. Some common scenarios for dogs afflicted with CCD are appearing lost or disoriented in their own homes, changes in temperament, losing housebreaking skills and changes in sleep-wake cycles. While CCD is a degenerative disease there are some medications on the market that may slow disease progression. Above all, pet owners and pet-care professionals need to understand that age itself is not a disease. It just means that a pet has an increased likelihood of experiencing certain problems and illnesses. Source: November/December 2014 issue of Pet Sitter’s World.